← Television Tuesday; The Miniaturist. The Japanese eggplant caught my eye because they were beautiful, so I bought some. I thought they’d make a nice saute to go with the salmon that night, and I was right. 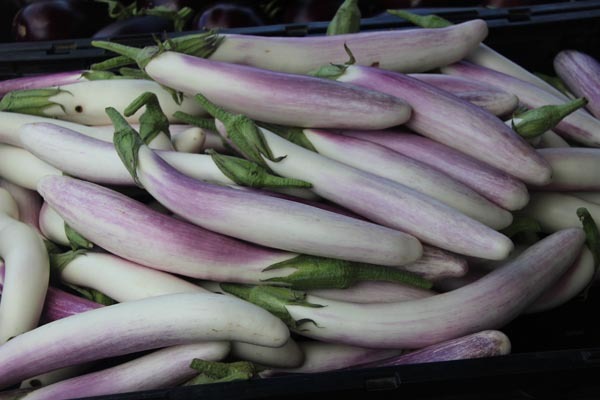 Japanese eggplant at the Sebastopol Farmers Market. I sliced the eggplant into 1/8 inch slices a bit on the diagonal. (They looked a little bit like banana slices!) I heated 2 Tbsp olive oil in a skillet over high heat until the oil began to shimmer and move in the pan. Then I put in the onions first, turned the heat to medium high and sautéed them until they were tender and translucent, about two minutes. Shortly after the onions went in I added the garlic. I used to put the garlic in first, but it tends to burn and get bitter. 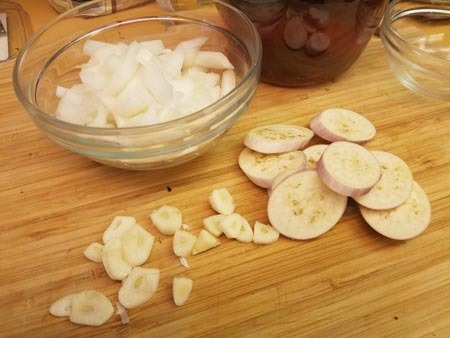 Onions (I chopped them more finely than this but not much), eggplant and sliced garlic. 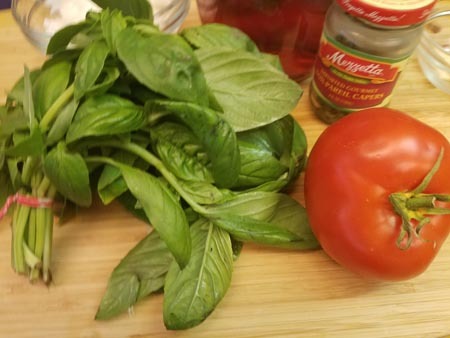 Fresh basil, onions, capers and fresh tomato. Once the onion were gleaming and tender I added the eggplant. I stirred frequently so that all the eggplant slices soaked up the olive oil, the garlic and onion. After about three minutes I added the capers. I stirred for another three or four minutes. I added the tomato, then poured in the vinegar and covered the pan. I let it cook for about another three minutes, stirred in the basil and served it with the salmon, along with steamed chard and salads. It was tasty and held up to the strong flavor of the fish. 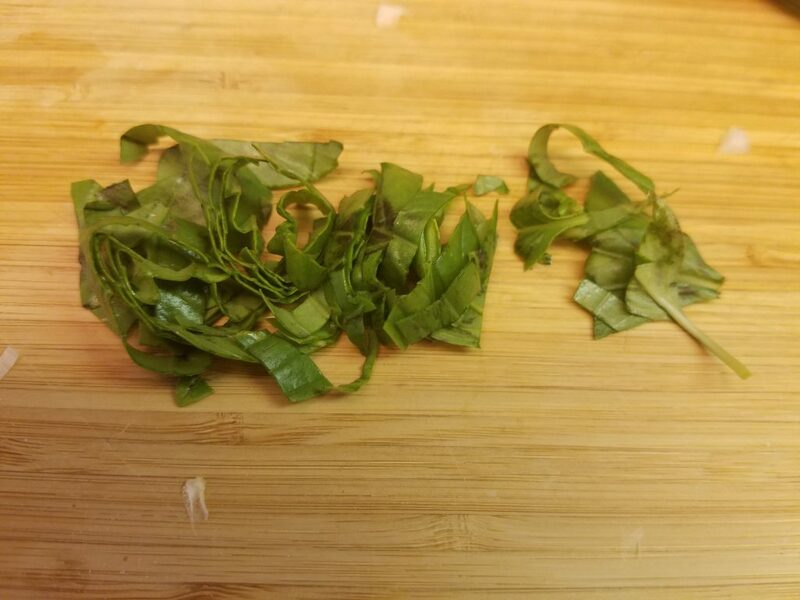 Layer the leaves, roll them lengthwise like a cigarette, then slice narrowly. That wasn’t the best meal I got out of that recipe though. There was about half a cup left over. The next day I mounded it onto a slice of dense, crusty buckwheat bread from Revolution Bakery, added two slices of Matos Family St. Jorge cheese on top and slipped it under the broiler until the cheese melted. That was lunch. It was yummy. 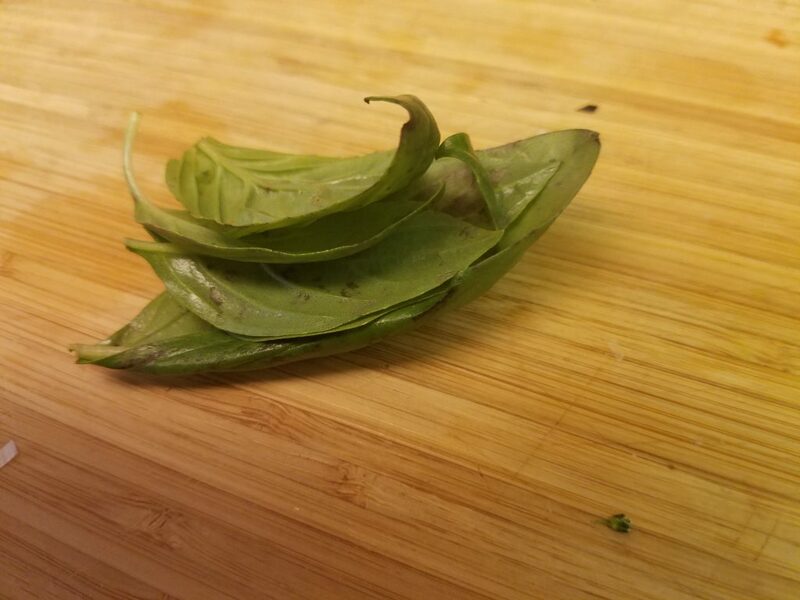 This entry was posted in Ruminations, Uncategorized and tagged Basil, Eggplant, garlic, onion, saute. Bookmark the permalink.